Why would you want to get married in Morocco? Apart from the scent of rose petals everywhere and the feeling of being in part of an Arabian Nights story, this is a beautiful country and very hospitable. With rich and ornate colours in the buildings and décor, the colour palette for a wedding is endless and many of the resorts offer a traditional Moroccan wedding package. If you're thinking of getting married in Morocco then you're about to experience some of the oldest traditions of the country. The pre-wedding parties are legendary and a wonderful way to embrace the culture. There are hammams and henna painting which are part of a bridal experience and the tradition here. 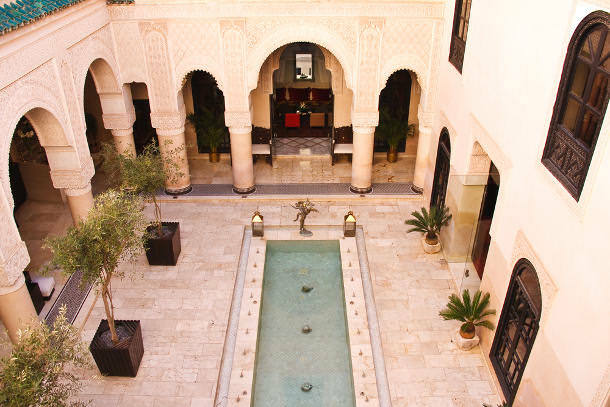 Morocco has some spectacular venues for a wedding from palaces to hidden riads and courtyards, or even the beach. If you want a romantic and exotic setting for a special day then this is it. June to August are hot and arid, with March to May and September to November warm and pleasant. It can get cold at night in the Atlas Mountains, and outdoors during winter. Spring and Autumn are ideal for weddings here. Avoiding Ramadan is important because people don’t eat during the day, and it may be more challenging to get events organised during the daytime period. Morocco is an Islamic country and so there are cultural traditions to observe. Some of the most common ones are that visitors, especially women, should dress respectfully. Shorts and sleeveless clothing is not considered polite. Using the left hand is also offensive. There are specific wedding traditions in the Moroccan culture. Painting hands with intricate henna designs, and being dressed in rick exotic costumes are all part of a bridal experience. The geometric designs on the henna are said to ward off evil and encourage fertility. Moroccan cuisine is famous throughout the world. From tagines to mint tea and spices this is the perfect place to plan a feast. Many Moroccan dishes are made for sharing which gives some inspiration for a menu. If you're planning a wedding here, this is an Islamic country and not all restaurants are licensed for alcohol, so do check this out when making arrangements for a celebration. There's no rule about tipping in Moroccan restaurants, however many restaurants will add 10% service charge to the bill in tourist areas. The rule of thumb is if you feel like you've had good service then leave a tip, if you feel like it left a lot to be desired then don't. The Moroccan Dirham (MAD) is the accepted currency in Morocco, and suppliers will generally expect payment with dirhams. There are ATM machines in the cities, and credit cards are accepted in major hotels and resorts. Tipping 5-10 dirhams to the taxi driver, tour guide, chambermaid or bellboy is much appreciated. Food and living is generally cheaper than in Europe or North America. There are costs associated with marriage documentation and the ceremony itself which are similar to UK and US charges. A wedding package in a romantic riad costs around £4000 whilst hiring a venue at a luxury resort can be as much as £45,000. The following notes are not comprehensive and are intended as a guide only. Before planning your wedding in Morocco we strongly advise you to contact the Morrocan embassy in your home country or your country's embassy in Morocco to obtain up-to-date legal requirements. All marriage ceremonies in Morocco are conducted under Islamic law. Non-Muslims can marry in Morocco if they are non-resident. A civil marriage ceremony in Morocco is not always legally binding, therefore couples are advised to get a civil marriage agreement and to obtain legal advice in their country of residence before travelling to Morocco for their wedding ceremony. For those marrying Moroccan nationals the residency period is 21 days. Non-Moroccans marrying a Non-Moroccan should check with the Moroccan embassy in their home country as the residency periods vary between regions. The documentation required for a marriage ceremony can also vary depending on where in the country you intend to get married. The documentation is approved by the Adoul or local religious notary’s office. Non-Muslims need to prove they are either Jewish or Christian. Gay marriages and civil partnerships are not recognised in Morocco. Morocco is divided into 16 regions which are further sub divided into 62 provinces. Each region is very different and has its own character. Choosing where to get married can be difficult as there are so many lovely areas to get to know. Find out more about the Regions of Morocco or browse our Moroccan Wedding Directory to start planning your dream wedding.